Today the UPS man came and left something FOR ME! I checked it out and even smelled it. I was curious. 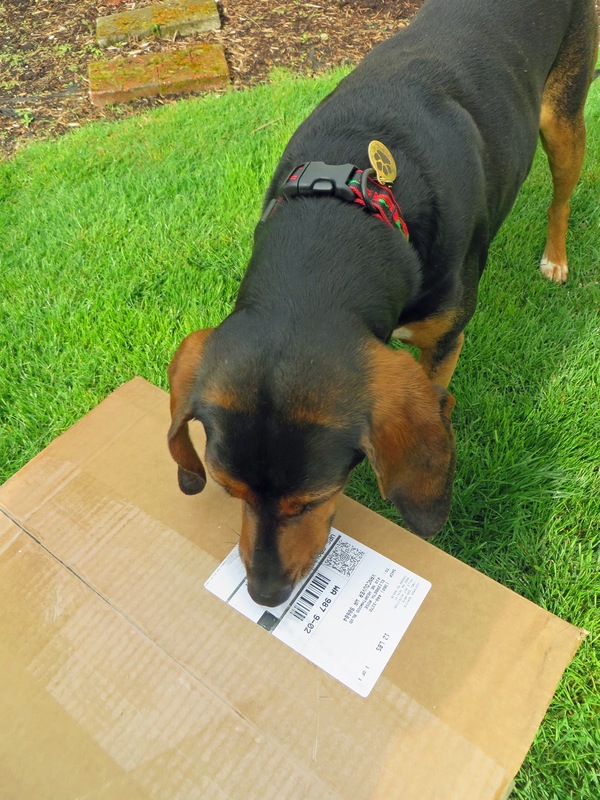 Soon, I will tell you what was in this huge box. But for now, what do YOU think is in the box? Here's my fancy brass dog tag. It has my phone number on the other side. I had quite an adventure yesterday. It was an exhausting day and I went to bed without dinner. Here's what happened. I had my treats and was getting settled in the garage while my owner went to Portland for the afternoon. She was going on ANOTHER architectural walking tour. She promised to be back by dinner time. Like I said, I was settling in and ALL OF A SUDDEN THE GARAGE DOOR OPENED! A little freedom had come in to my life! I trotted out and started doing some squirrel hunting in the cul de sac. Then the garage door closed, very mysteriously. And, later, out of the corner of my eye I saw my owner drive away. Now I like freedom and have gotten out before. I'm not one of those dogs who comes home and waits on the front porch for their owner. Heck no! I follow my nose... wherever it might take me. Remember the beautiful chile design collar my owner brought me from Gig Harbor? Well, she wouldn't let me wear it until I got my brass engraved dog tag from www.dogids.com and that's what I had on yesterday. The tag gleamed in the sun while I trotted around the houses looking for squirrels. So I decided to go to the next street. I was walking by the house with the swimming pool and jet skis. The lady was working in her garage and saw me and my beautiful collar. She said, "come here, girl." And I went right to her. She looked at my fancy dog tag with my phone number and called the number. No answer. I thought she'd let me go but she didn't. She put me in their back yard. All of a sudden, their dog, who I'll call Ms. Pitty-in-your-face, came running over. She was surprised to see me in HER yard. She decided I was there for a play date. She kept bugging me to play and wouldn't leave me alone. I was really annoyed... with her and about being trapped in her yard. So I lost my temper and growled and snapped at her. She finally backed off. Thank goodness! I looked for an open gate or a way out. There wasn't any. I started whining and cried a bit "I WANT TO GO HOME!" The lady tried to get my owner on the phone again with no answer. About 5 pm something happened. She brought me inside her house and said MY OWNER WAS COMING TO GET ME! 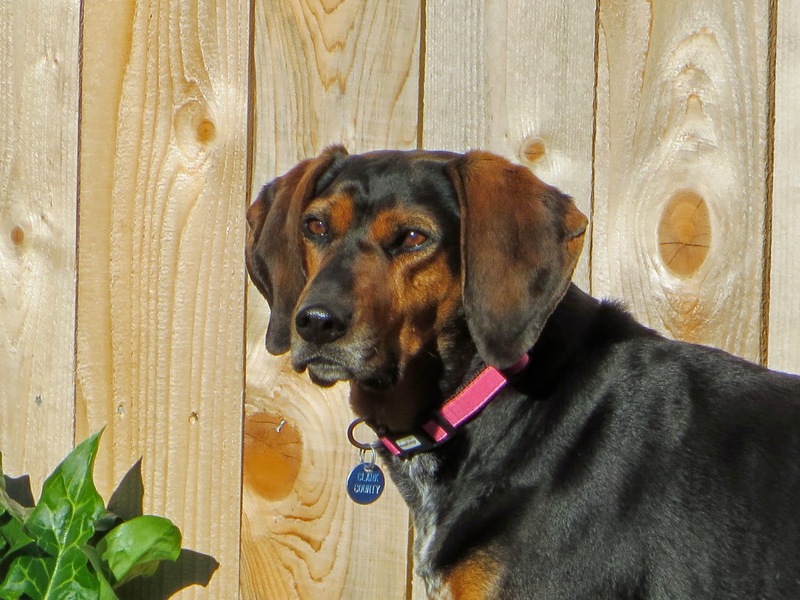 Here I am modeling my new collar and dog tag. It was about dinner time, so she was coming to get me just as I was thinking about dinner and wondering what type of dog food Ms. Pitty-in-your-face ate. So I went home. I was so happy to be home, I went right to my cushy bed and went to sleep. You see, when you have a pit bull in your face, you don't get in very many naps! And my owner learned a lesson. She removed the mini remote control for the garage door from her key ring. The remote turned on at the slightest touch and that's how I got out! 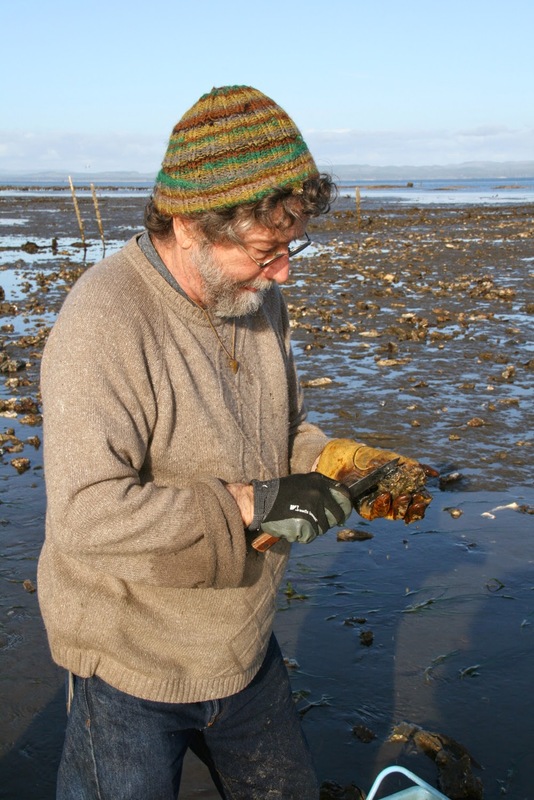 Here's David out shucking an oyster. He didn't give ANY TO ME! I just remembered that I promised a part II to my story about hunting on the Long Beach Peninsula. 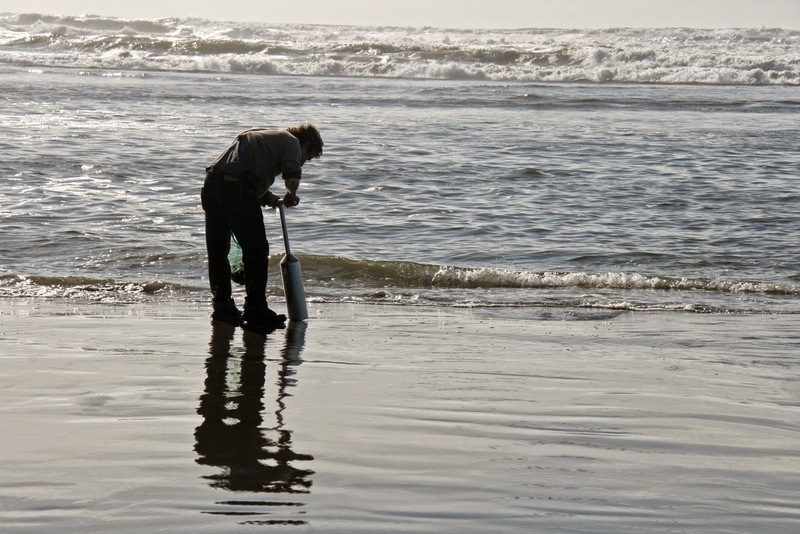 Part I was the razor clam hunt where I nearly drowned. So once I dried off, I hopped in the car and we drove off the sand and back onto the paved road. We were headed to the bay side of the peninsula where the oysters were hiding. I heard there was mud, but no waves, so I was up for the hunt. We got to the Nahcotta Tidelands and looked around. The guys got their oyster hunting gear out of the truck. I was about ready to jump out of the car when it was decided (without input from me) that I was not welcome on the hunt. It was said that I might cut my paws on the oyster shells. Needless to say, I was devastated. I sat in the car and watched them walk out, onto the mud flats and start the hunt. They guys were actually eating raw oysters. I was hoping they would bring one back to ME! They were out there about 20 minutes and my owner, probably feeling guilty, turned around and walked through the mud and the grass to the car. She didn't bring me ANY OYSTERS. 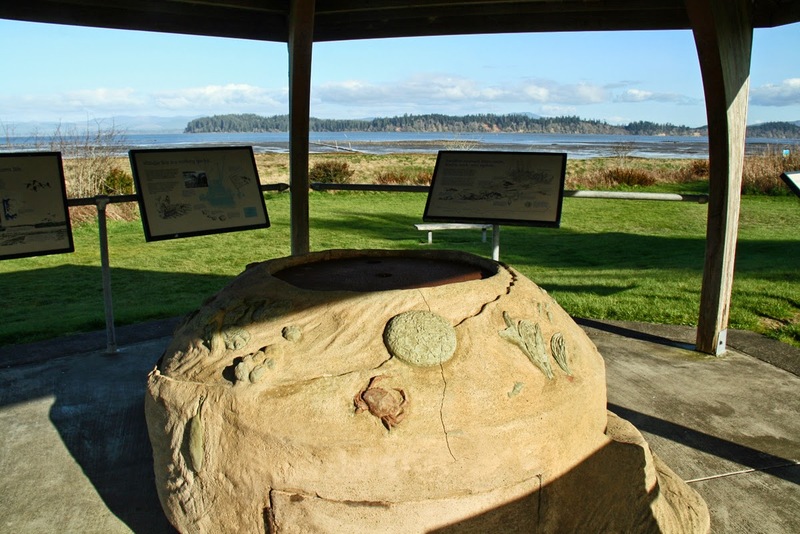 But she did get me out of the car so I could take a little walk and look at the interpretive signs. get out of the car and read them. But that's it! I guess I was lucky I didn't get my paws all muddy, anyway. It might have led to a BATH! So that's the end of my tales of my trip to THE BEACH. I learn something new each time I go. 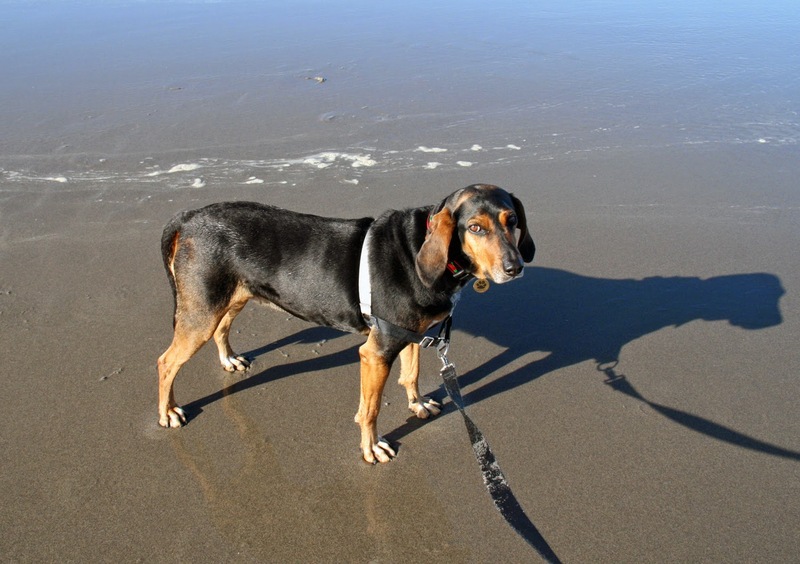 But always I get to have at least one walk on the beach to sniff around and look for crab shells and the like. at the beach! We could see everything! Chewie says, "This is by no means an exhaustive list. We humans eat an insane variety of food, and we’re social creatures who love to share. So please remember that dogs’ bodies don’t always work in the same way, and that some foods can be toxic. If you’re ever unsure about feeding your dog a particular food, just don’t do it. Likewise, if your dog ate a food you’re not sure about, call your vet." I just couldn't write about this yesterday. I was just too angry. In fact, I was livid! You see, my owner took me to the Farmer's Market here in Vancouver, WA because it was opening day. But she didn't check the weather report. It was raining cats and cats! We parked near the Crab Shack after noticing that there were tons of fishermen out on the Columbia River in their little boats. They all were dressed for rain, wearing slickers and gum boots. They knew the fish would be running. We got out of the car and as soon as we walked under the I-5 bridge, it started to sprinkle. Well, my owner didn't turn around. She told me it wouldn't rain hard... just a little. By the time we got under the train overpass IT WAS POURING! I ASKED TO GO BACK. SHE SAID NO! So we walked up to the Hilton. i was getting wet all over. I tried to go inside the Hilton to join the gaming conference going on. It looked nice and warm inside. I could have rolled on the carpet to get dry. BUT NO! We were there to wait until the rain let up. Finally it did. conference at the Hilton where it was dry. So we headed over to the market. I was dripping wet and none too happy. A young couple petted me anyway. Things were looking up. When we were at the La Center Heritage Farms Booth to buy a broccoli plant, it happened. 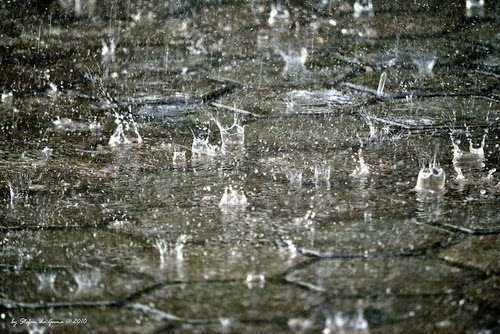 THE HEAVENS OPENED UP AND IT POURED AGAIN! 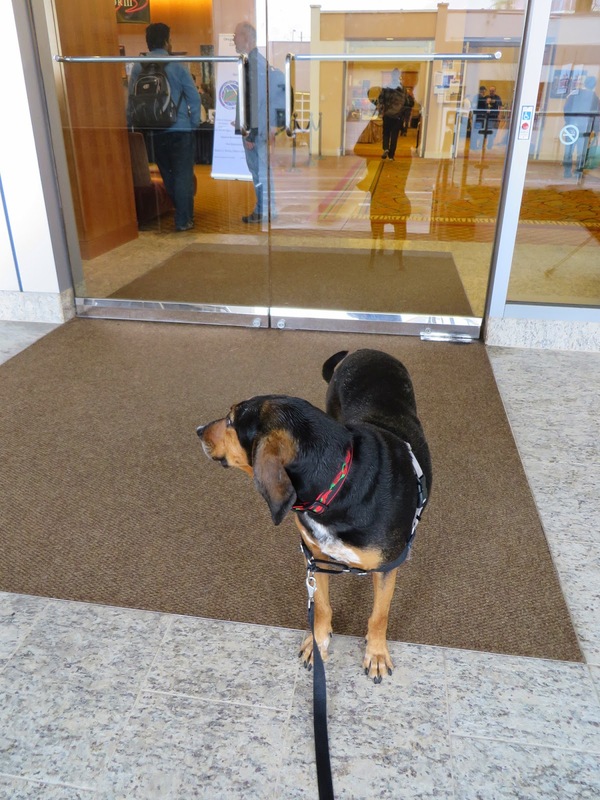 This time we headed back to the car IN THE RAIN and took refuge at City Hall outside the side door. It didn't let up. I started shivering. So we kept walking IN THE RAIN and made it back to the car. I, of course, wanted to stop at The Red Lion to go inside. BUT NO! Here I am in the car. Look how wet I am! I was mighty glad to see my car. I hopped inside and my owner put a blanket around me and turned up the heat. 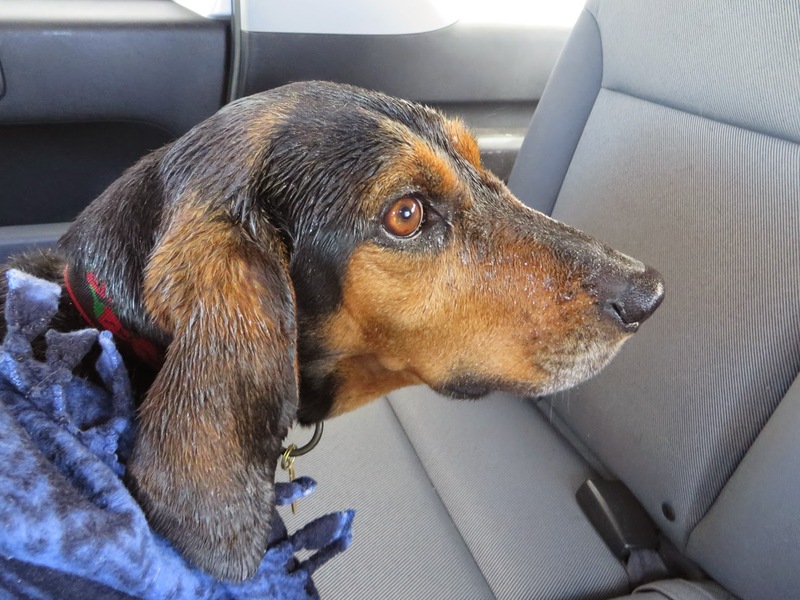 By the time we got home I was still wet and feeling mighty sorry for myself. 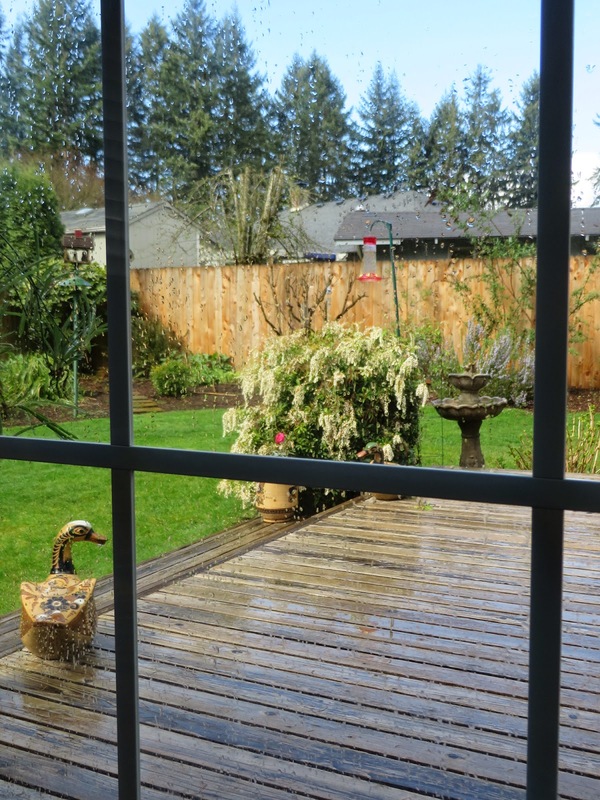 It rained again in our neighborhood but we were home. 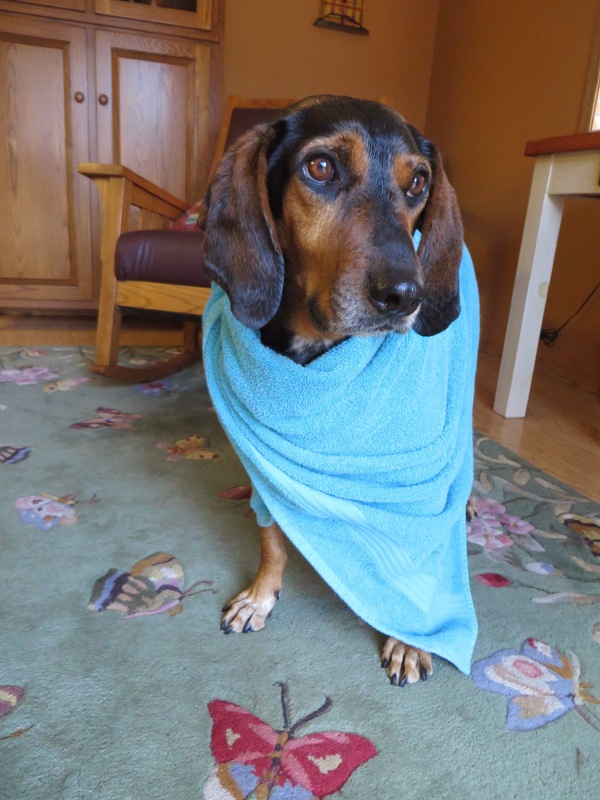 My owner rubbed me with a towel and I started to feel better (a treat would have been nice). It took two towels to get me dry. Then the sun came out! Hooray! I went outside and trotted around the yard looking for the best sunbeams. 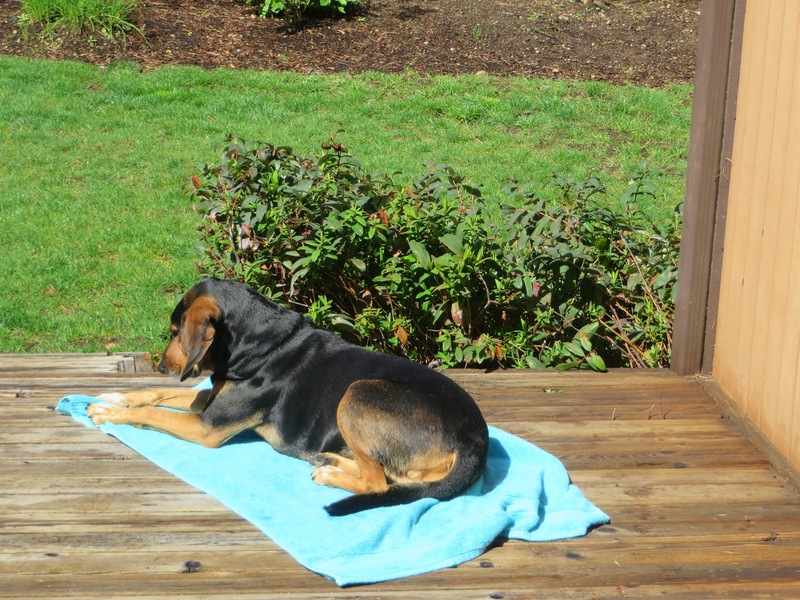 My owner put the towel out on the deck and I laid on it and lounged in the sun for the rest of the afternoon. I spent the rest of the day sunbathing. All of that suffering for one puney broccoli plant. IMAGINE! 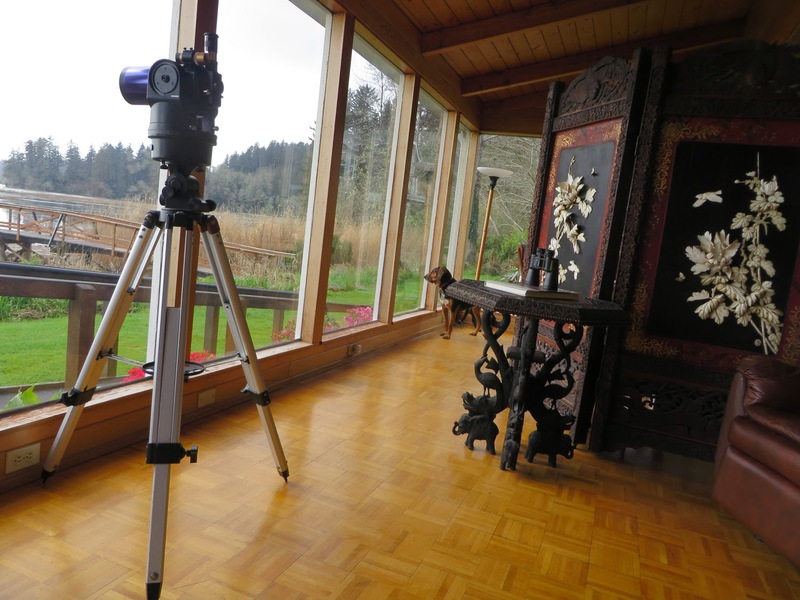 Every time I go to the Long Beach Peninsula here in Washington state, I have a new and exciting experience. That's why I keep returning. You never know what type of adventure I'll find myself involved with. This week I learned all about hunting clams and oysters. After all, I'm a hunting dog, right? Here's Dave and his clam gun. I always love hanging out at the beach. The smells are amazing. Just think... dry seaweed, crab shells, burnt marshmallows in old campfires. It doesn't get any better than that, does it? Well that's what I thought until I met Dave from the Shelburne Inn and his buddy. What they brought along with them smelled mighty good. They had clam guns, nets and a bucket, all of them smelled like clams. I signed up right away for clam hunting! 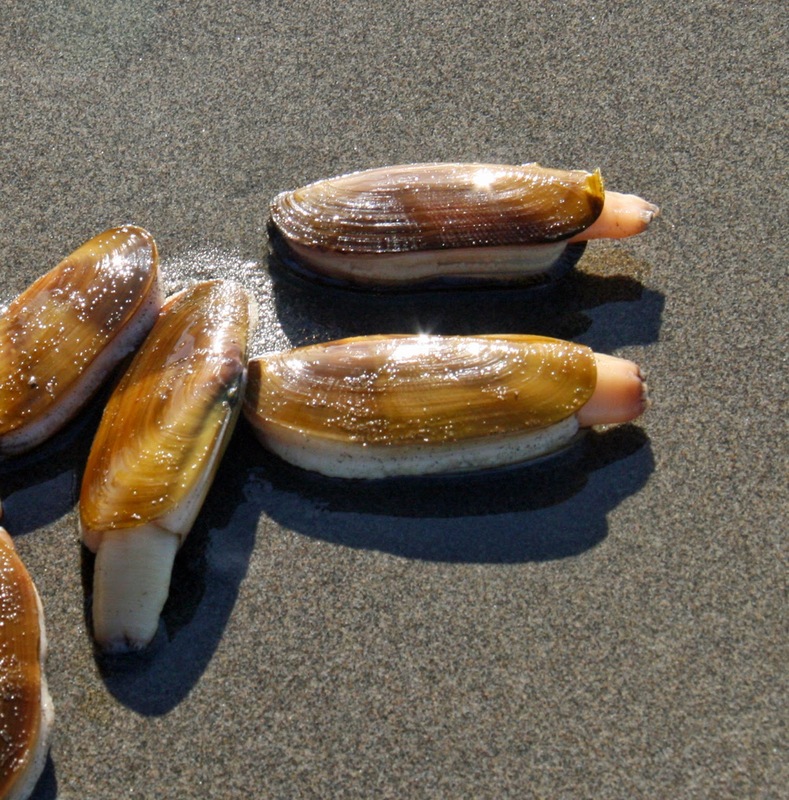 Here's what they were after... Razor Clams! Then I stopped. They were actually walking into the water where the waves came in. Well, I'm no surfer and I don't know how to swim so I pulled back. My owner was really into hunting so she kept encouraging me to go closer and closer. The guys found some clams. We all were so excited that we didn't see the big sneaker wave coming in. As soon as I saw it I started pulling for shore. But I got splashed and my owner got water in her boots. That was when I went on strike! No more clam hunting for me! Luckily the guys each bagged their limit and it was time to leave. Needless to say, I was drenched in sea water. Well, most of me, anyway. Here I am safe on the beach after my harrowing experience in the surf. Notice I am giving my owner the "stink eye" look! I was finished with hunting for the day. But we didn't go home. Next chapter... Oyster hunting! P.S. 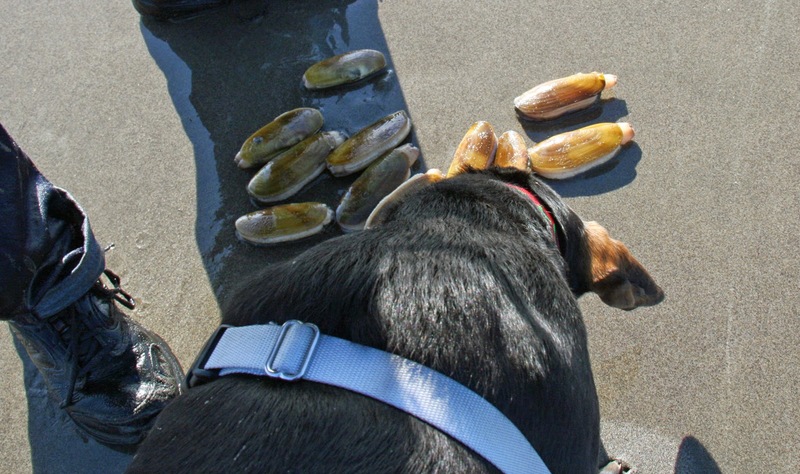 If you want to go Razor Clam Hunting, here's the information you will need. It's raining outside today so there is much less squirrel-chasing to be done. I saw one this morning digging in the garden so I scared that one away. So I was a bit bored. My owner knew just what to do to cheer me up! She showed me the gift she brought me from Gig Harbor, WA. You see, Gig Harbor has a shop for pets like me. It's called Sophie's Touch. 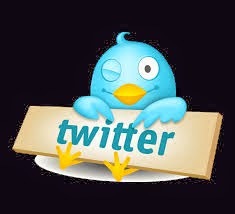 It is located right on the harbor and has so many things that I would like to see if I could go shopping in Gig Harbor. So what my owner picked out for me was a beautiful chile collar. It reminds me of my homeland in Santa Fe, New Mexico. So I got to see my collar and try it on. It fits perfectly. However, I can't wear it until I get a tag for it with my name and phone number. 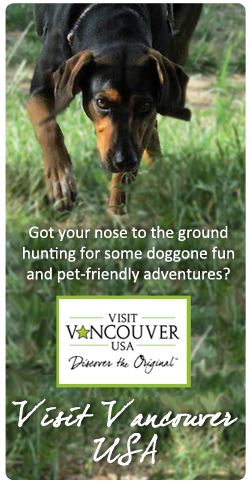 I have a tendency to follow my nose if I get out and I need that information on me so my owner can be called if I get lost (I love getting lost... it's a game!). So now I want to go to Gig Harbor. There are lots of things to do like walk the waterfront path, buy a canine float coat for when I go boating and go to Sophie's Touch to buy treats. Besides, it's only a half hour away from my Country Cousins! I love my new pink collar! Now they will quit calling me a boy! 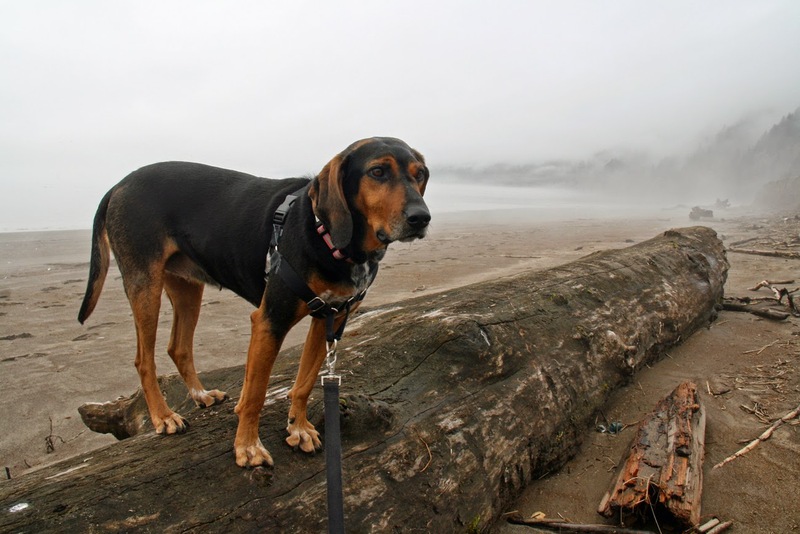 Here I am ready to jump off a log at the beach. I was kinda scared of the sea lions that came swimming out of the mist! Last year I had the greatest time at the Humane Society of Southwest Washington's annual walk and run fund raiser. The best part was that there were "treat stations" all over Esther Short Park! A "treat station" is what I call a vendor booth. 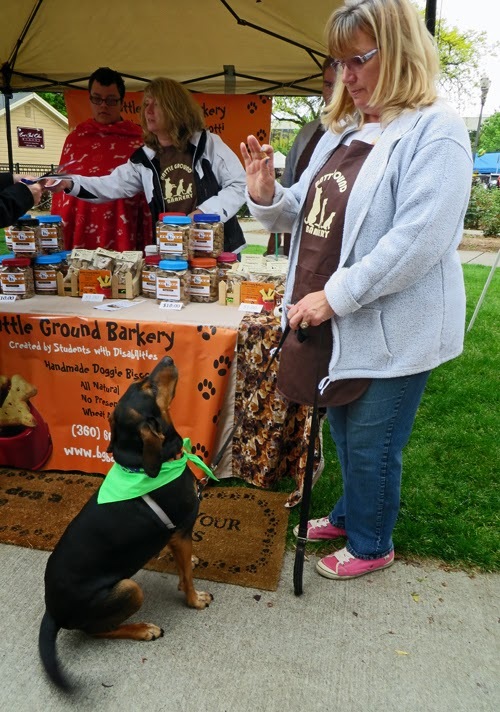 There were vendors representing home-made dog biscuits as well as larger companies. Most of them GAVE ME TREATS! Here I am in my official walker scarf asking for treats! This was last year. I plan to do lots of this again this year! I had my picture taken and I got petted. It was a great day. We chose the 3 mile walk along the Columbia River. I'm not into running... just walking and getting admired. Your registration includes a goodie bag with dog bandana, samples and treats, your choice of dog-friendly walk or timed-run, access to the Party in the Park with animal loving businesses and organizations AND the chance to earn great prizes through fundraising. It's all for the dogs and cats! Do Sea Lions Eat Dogs? I, Cinnamon, have an opinion on this. I'm afraid of Sea Lions. When I was in Lincoln City on Siletz Bay, the seals in the water were eying me and following me as I walked the beach. I think they thought I was a threat. They might not want to eat me but I do believe they'd jump out of the water and fight me, especially if I had a fish near me! I don't recommend that dogs swim in an area where seals and sea lions are active. Why take a chance? Recently, I was headed to the Long Beach Peninsula. We stopped at a place called Skamokawa Vista Park. We walked along the Mighty Columbia River (my favorite river) and all of a sudden a whole bunch of huge sea lions appeared in the mist. They were swimming up river. I think they had their eye on some of the salmon and didn't notice me. But I noticed them and backed away to play on some logs. I recommend keeping a distance from these pinnipeds (I just learned that term)! Here's an article that tells more about dogs and sea lions. Not everything on the beach is safe for us dogs. It's a wonderful place if we are careful.